The Monday morning was very snowy in New York. A snowstorm started to blanket the region in the morning. The snowstorm moved in during Sunday night and also dropped about 3 to 5 inches of heavy and wet snow. 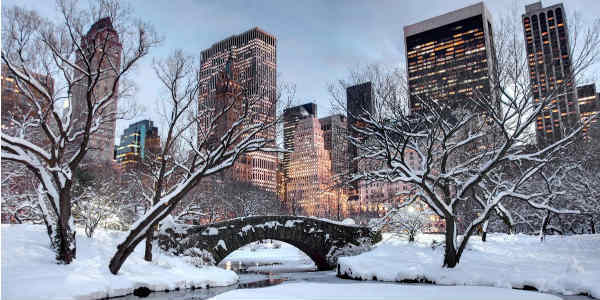 It was predicted that the snowfall was the heaviest recorded during this time of the year in New York. There was a winter advisory alert put into effect until 2 pm. There were fears that the roads would get very slippery and the visibility will also get greatly reduced. The storm was not a Nor’easter. Even though the New Yorkers celebrated a “four’ Easter” which four nor’easters hitting the region in a month, this cannot be counted as the fifth Nor’easter. This storm does not have the magnitude to be called a Nor’easter. To qualify for a Nor’easter, there must be sustained winds of 34 knots. The winds that were seen on Monday reached about 25 to 28 miles an hour. But, it was a strong one and this is why the met department sounded a warning. In fact, it was strong enough that the game between the Yankees and Tampa Bay Rays was postponed to Tuesday. The weather cleared in the afternoon and there was good sunshine.